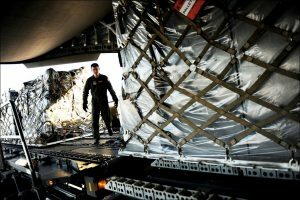 AAR, an independent provider of aviation and defence aftermarket solutions, has been awarded a US$10.8m order from the US Air Force for the production of 463L cargo pallets. The cargo pallets will be manufactured at AAR’s Mobility Systems business unit in Cadillac, Michigan. The 463L USAF design uses a lightweight balsa wood core that continues to provide unmatched strength-to-weight performance and reliability compared to alternative commercial pallet designs. The pallets are designed to be loaded and off-loaded on a variety of military and commercial aircraft.